ILAGAN City’s Eljay Marco Vista and Baguio City’s Aesha Kiara Oglayon ruled the cadet boys and girls poomsae individual events, respectively, at the start of the taekwondo competition of Philippine Sports Commission’s (PSC) Batang Pinoy Luzon leg on Monday, March 18, at the San Felipe Covered Court in Ilagan. The 12-year old Vista, a Grade 6 student from Ilagan South Central School, tallied 7.67 points in the finals to edge his rival Kacey Canlas of Olongapo City, who settled for silver medal with 7.60 points. “Sobrang saya. Matagal ko po pinaghandaan ang Batang Pinoy kaya sa finals, tinatagan at nilakasan ko ang loob ko,” said Vista. 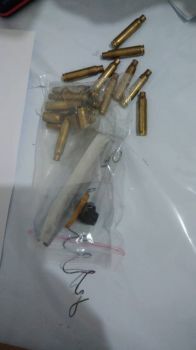 “Four years old pa lang ako, naglalaro na ako poomsae. 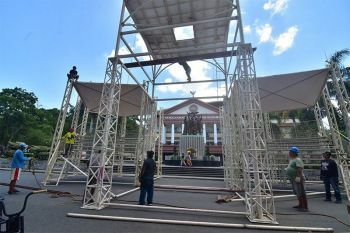 Pangarap ko talagang i-represent ang national team at magbigay ng karangalan sa Ilagan City,” he added. Baguio City’s Wreily Canao (7.46) and Jaymers Diaz (7.455) of Dasmariñas City grabbed the bronze medal of the event organized by the PSC for in-school and out-of-school children aged 15 years old and below. Not to be outdone was Oglayon, who drew 7.82 points in the finals of the cadet girls poomsae individual event, beating her teammate Khyla Kreanzzel Guinto, who settled with silver with 7.765 points. 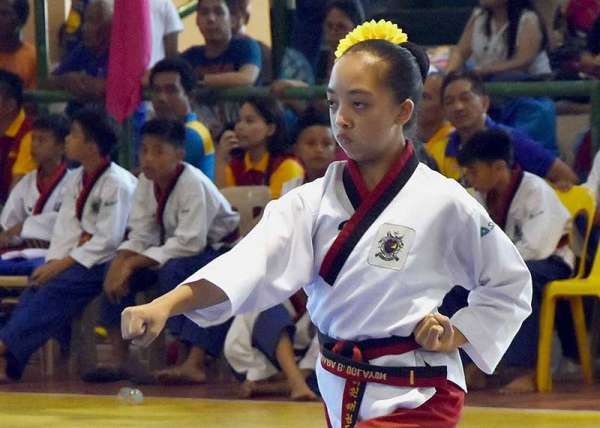 “Masaya at nakuha ko ang gold,” said 13-year old Oglayon, who also won the gold medal in the team and pair poomsae events of last year’s Palarong Pambansa in Vigan City. Oglayon also won the bronze medal in the individual event in Palarong Pambansa. Grabbing the bronze medals in the cadet girls poomsae individual event were Paranaque’s Antonette Medallada (7.65) and Princess Mariano of Pangasinan (7.635). In the junior cadet male individual poomsae event, Quezon City’s Ian Matthew Corton bagged the gold medal after scoring 8.105 points, beating Quezon Province’s King Nash Alcairo (8.04). Naga City’s Emmanuel Christopher Austria (7.95) and Alicia’s Carl John Viloria (7.88) settled for bronze medals in the event that drew 28 participants all over Luzon. The swimming competition starts Tuesday, March 19, at the Isabela Sports Complex with multiple golds at stake in the 12-under and 13-15 age group categories. In other opening day event, Olongapo City beat Ilagan City, 21-5, 21-4, in the preliminaries of boys beach volleyball at the Ilagan City Sports Complex. Pangasinan edged Mandaluyong, 21-18, 21-5.